Well, this is a turn up for the books (sorry) – I seem to have already read all but one of the paperbacks published this June that I’m interested in. I’ll kick off with one of the few successes from my Baileys Prize wish list back in February: Petina Gappah’s The Book of Memory which made it onto the longlist but not the shortlist, sadly. Within the first brief paragraph, Gappah manages to hook you with both a grisly death and the announcement that our narrator, a black Zimbabwean albino now on death row, was sold to a strange man by her parents. Memory slowly reveals her story finally delivering a devastating denouement. A multitude of well-aimed barbs are shot at modern Zimbabwe along the way, all spiced with a hefty helping of Memory’s acerbic wit. Stephanie Bishop’s The Other Side of the World was also on my Baileys wish list, more in hope than expectation it has to be said. Despite its rather insipid jacket it’s a smart, elegantly understated piece of writing which looks at the complexities of parenthood and marriage, belonging and dislocation, following Charlotte and her family across the world from her beloved Cambridge to Australia where her husband Henry is intent on proving himself. Bishop tackles the tricky theme of motherhood with an unflinching honesty, exploring its contradictions with a powerful subtlety. Marriage and motherhood pop up again in Gebrand Bakker’s June. It’s set largely on a single Saturday in a small Dutch village but at its centre is Queen Julianna’s visit on June 17th 1969 nearly forty years before, a day of celebration which turned into tragedy when a farmer’s two-year-old daughter was killed. Her mother has regularly taken herself off to the hayloft over the forty years since the accident, ignoring all attempts to talk her down. There are no fancy descriptive passages littered with similes and metaphors in Bakker’s writing: it’s clean and plain but richly evocative for all that. Patrick DeWitt’s Undermajordomo Minor has more than a touch of the Gothic fairy tale about it: a dour castle sitting atop a remote mountain, warring factions complete with a heroic ‘exceptionally handsome’ captain, a fair lady with whom our own hero falls in love and a satisfying arc of redemption. It opens with seventeen-year-old Lucy Minor leaving home to take up the titular position of undermajordomo. His mother sees him off from the cottage door, barely waiting for Lucy to close the garden gate. Lucy is glad to be on his way, hoping for adventure, convinced that he is meant for better things. Like DeWitt’s previous novel The Sisters Brothers, Undermajordomo Minor has a richly cinematic quality which brought to mind Wes Anderson’s The Grand Budapest Hotel in its almost cartoon-like depictions of the odd world in which Lucy finds himself. A thoroughly entertaining novel. The only unread title in this month’s paperback publishing schedules that takes my fancy is Liza Klaussmann’s Villa America, largely because I enjoyed her debut, Tigers in Red Weather, set in a slightly Gatsbyesque world – although at the end of the Second World War. This new novel features the Fitzgeralds entertained, alongside the likes of Picasso, dos Passos and Hemingway, by Gerald and Sara Murphy in their villa on the French Riviera until a stranger arrives and the dream shatters. Novels peopled by historical figures are sometimes far from successful but such was my enjoyment of Klaussmnn’s first novel that I’ll be giving this one a try, and that cover is lovely although it would have been so much more elegant without the Tigers in Red Weather inset. That’s it for June. A click on a title will take you to my review for the books I’ve already read and to Waterstones website for the one I haven’t. If you’d like to catch up with the month’s hardbacks they’re here and here. This entry was posted in Reviews and tagged Gerbrand Bakker, June, Liza Klaussmann, Paperbacks published in June 2016, Patrick Dewitt, Petina Gappah, Stephanie Bishop, The Book of Memory, The Grand Budapest Hotel, The Other Side of the World, The Sisters Brothers, Tigers in Red Weather, Undermajordomo Minor, Villa America on 30 May 2016 by Susan Osborne. This was the first book I read for review after coming back from my hols. I was looking for something uncomplicated, nothing very taxing, and Stephanie Bishop’s novel with its gold-type adorned jacket looked like it might fit the bill but it took me by surprise. 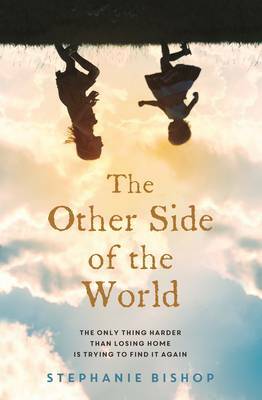 The Other Side of the World turns out to be a smart, elegantly understated piece of writing which looks at the complexities of parenthood and marriage, belonging and dislocation. The press release compares it to Rachel’ Cusk’s A Life’s Work but Bishop’s novel is altogether more subtle than that. We know from the prologue that things have gone awry as Charlotte waits nervously in her small Cambridge bedsit, hearing the noises of her husband’s arrival but not the sounds of her children. From here, Bishop turns back the clock three years to 1963 when Charlotte, Henry and Lucie are crammed together in a tiny cottage in the dank, October English countryside. Charlotte has just learned she’s pregnant again but has yet to tell Henry. Lucie is only seven months old and Charlotte dreads the demands of another child. Once an artist, she has time for nothing but Lucie, struggling to keep on top of housework, cooking and childcare while Henry works as a lecturer. Charlotte takes solace in countryside walks, alive to the natural world whatever the weather, while Henry longs for the warmth of his Indian childhood, never quite accustomed to the English climate despite being sent to school in Britain to avoid the tumult of Independence. Henry is Anglo-Indian, fitting into neither country comfortably. When a leaflet arrives extolling the virtues of emigration to Australia, Henry sees an opportunity but Charlotte is reluctant: he may be rootless but she is not. Finally, she agrees to go if he can find a job. By 1965 they’re heading to Perth, now a family of four. Charlotte struggles with this alien, harsh landscape whose climate is either scorching or cold, while Henry finds that Australian academia is not quite as tolerant of his mixed race as he’d assumed. A crisis is clearly in the offing. The theme of motherhood is not an easy one to tackle with honesty – the aforementioned Cusk came in for a great deal of stick when she did it – but Bishop succeeds in exploring its contradictions with a powerful subtlety. Charlotte has longed for a child but finds the reality hard. Henry is a good father, spending more time with his children than many men did in the 1960s, but it is Charlotte who bears the brunt of the hard slog of childcare. When regretting her agreement to go to Australia she remembers that ‘She was, quite literally, not herself then, but a woman dispersed among her children.’ The narrative shifts smoothly between Charlotte and Henry, equally subtle in exploring Henry’s growing awareness of his rootlessness and others’ perception of his racial identity. Bishop’s descriptions of both the English and Australian landscapes are vivid, often used to convey the ache of Charlotte’s longing for home. It’s a quietly perceptive novel – a meditation on parenthood, marriage and belonging all wrapped up in gorgeously understated prose. The final chapter is a triumph, neatly sidestepping clichéd sentimentalism. Bishop’s first novel seems to be unavailable in the UK . My hope is that Tinder Press, who have a sharp eye for this kind of fiction, will publish it in paperback. This entry was posted in Reviews and tagged 1960s, A Life's Work, Australian fiction, Motherhood, Rachel Cusk, Stephanie Bishop, The Other Side of the World, Tinder Press on 26 August 2015 by Susan Osborne.